Looking for luxury restaurants in Russia's Northern Capital? If so, you're in the right place. 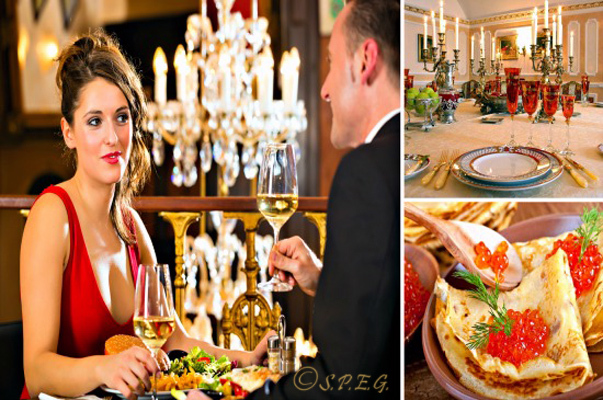 You will never forget your first meal in one of the luxury restaurants in St Petersburg listed here. For us, it was dinner at L' Europe Restaurant, inside the legendary Grand Hotel Europe on the famous Nevsky Prospekt. A couple having dinner in a luxurious restaurant in St Petersburg, Russia. We had very attentive service, top class food and were treated like two Russian royals! Of course it wasn't cheap, but overall it was a great experience, although there was some lack of finesse in the food which you would expect in New York or Paris at these prices. If you too, want to eat and feel like a Tsar during your visit to the city of St Petersburg, then you should try one the most popular luxury restaurants in the city. Each of them offers a unique royal atmosphere, plenty of caviar and vodka with an authentic Russian food that is well presented served and very tasty. Do you have money to splurge? If so, our list of luxury restaurants below will give you a taste of the royal life and make your dinner unforgettable. Tip: Everyone loves drinking champagne, but sometimes a few cups of champagne may cost you more than your overall dinner. For example, a glass of basic Taittinger will set you back 1600 rubles, about $30/€28. We all know that this is common practice in many high-end restaurants across the world, but some of the St Petersburg's luxury restaurants seem to have taken it to an extreme. So be careful! Top-Notch bar Restaurant, Delicious Russian food, Theatrical atmosphere! Regardless of if you’re staying at the elegant Grand Hotel or not, don’t miss the chance to sample one of the best Russian cuisine at the Caviar Bar and Restaurant. Seen as one of the most unique luxury restaurants in Russia’s Northern Capital, this place is a must try! Here you will taste the best beef Stroganoff and Russian caviar in town as well as many other delicious Russian dishes accompanied by a shot of Russian vodka as recommended by the city's only vodka sommelier. Definitely, the live music, amazing Art Nouveau style setting and attentive service and the incredible food will make your dining experience at Caviar Bar memorable. Timeless Elegance, Tchaikovsky Nights, Jazz Brunch and Top-class food! Another posh place to try at the famous Grand Hotel Europe is L'Europe restaurant, one of the most elegant and charming luxury restaurants in St Petersburg. Its splendid art nouveau furnishings, masterpiece stained-glass murals and remarkable service make this dining spot a really unique one. Here, the finest Russian dishes and superior entertainment will take your dining experience to a whole new level. Imagine the flavors of Beluga and Oscietra caviar atop delicate blinis melting on your tongue while you enjoy a graceful ballet performance of Tchaikovsky or the soothing sounds of jazz! If you go, book a table on a Friday! A once-in-a-lifetime elite dining experience, Great food, Wine Cellar tours! Located in a section of what was once the Stroganov Palace, the Russian Empire is one of three luxurious dining rooms, each with their own grandiose atmosphere. Here you can drink wine from Bohemian crystal glasses and dine on Versace porcelain plates under an umbrella of 24-carat gold ornamentation. Also, you will be offered an exquisite menu that hosts blinis and caviar, pelmeni, sturgeon and lamb racks along with a splendid wine selection and flawless service. Very Italian style, Cozy Atmosphere, Extensive Wine Selection! Francesco is a popular Italian trattoria built in a traditional Tuscany-style setting located right in the heart of beautiful St Petersburg. Inside the atmosphere is unpretentious with antique décor, delightful bird cages and pottery-filled hutches. It exudes a homey, Italian-style ambiance – one that welcomes friends, family and lovers to relax and raise their glasses in salute to life and to each other. The wide wine list coupled with fine Italian dishes made only of the freshest ingredients will surely delight your palate and satisfy your soul. If you're seeking unique Italian food and the spell of romance, here you'll find all the magic you need. Exquisite Wine Bar, Upscale Setting, St Petersburg Jewel! If you're in the mood to experience the finest vintage wine selections in all of St Petersburg, this savvy restaurant is the place to visit. However, the vast selection of fine wines is not the only thing you'll love about dining here. Grand Cru is making its mark as an urban establishment with its minimalist chic décor, molecular cuisine, unique food and skilled sommeliers ready to assist you in matching the perfect wine to an amazing meal. Grand Cru has brought together all the elements in perfect harmony and the reviews of this upscale Imperial City restaurant tell the story. In short, this is a place you'll be talking about long after you've gone home! Imperial Russian Cuisine, Trendy Menu, Contemporary Atmosphere! Located inside the Rocco Forte Astoria Hotel at the center of St Petersburg, Astoria Café is one of the oldest and most polished luxury restaurants in the city. The essence of Russian splendor is found here and the menu of the Astoria Café follows suit. From the great view of St. Issac's cathedral to the contemporary atmosphere and traditional Russian cuisine, this elegant café is a great spot to relax and savour the food of Chef's Aram Mnatsakanov and Ian Minnis, as well as the history and the magic of Saint Petersburg. If you go, we recommend the “Pavlova” dessert, made from a delicate meringue and named after our famous Russian ballerina. Palatial Setting, Renaissance Art, Near the Hermitage Museum! Just a short walk from the famous Hermitage you can find Taleon Restaurant, one of the best luxury restaurants in the city, which offers an impeccable service in a stunning 17th century style setting. Voted as the best splurge Russian restaurant three times, guest at the Taleon are ushered into the dining room by a smiling Maître and seated before enjoying a spectacular culinary adventure of European cuisine mixed with international accents. It will be expensive, but the experience is worth the money! Five Star Dining, French Cuisine, Superb Service! If you're looking for an exquisite international menu rich with the flavors of France as well as Russian cuisine, the Beau Rivage would be your best choice. Considered one of the most romantic French luxury restaurants, here your dining experience will take you on a sublime journey into the heart of the Imperial City. The names on the menu read like a tour of French culture that will transport your taste buds to the steps of the Louvre. Known for its impeccable service and attention to detail, the Kempinski Moika 22 Hotel brings you the Beau Rivage, which makes your stay more than complete. For those with a refined palate and money to splurge, there is also Shalyapin, another great luxury restaurant to add to your list! Opened in 2008 in the heart of St Petersburg near the famous Smolny Cathedral, here you can try a wide range of wines and classic Russian dishes with a European twist, while enjoying the beautiful design and unique atmosphere that the restaurant has to offer. We are sure that at Shalyapin the food, live music, formal decorations and professional service will make your dinner a pleasant and memorable one.